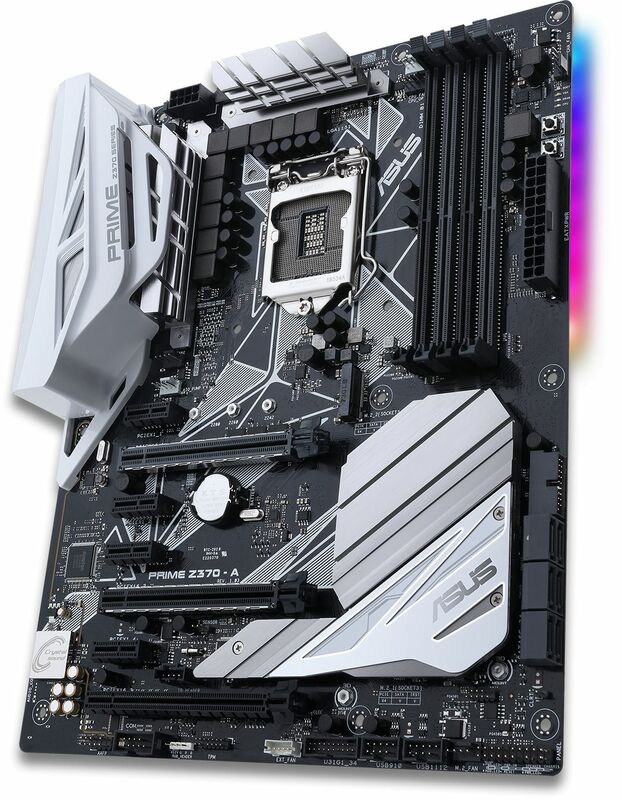 The ASUS PRIME Z370-A motherboard supports 8th Generation Intel Core i7 / i5 / i3 processors in the LGA1151 package and has two 32GB/s M.2 slots. 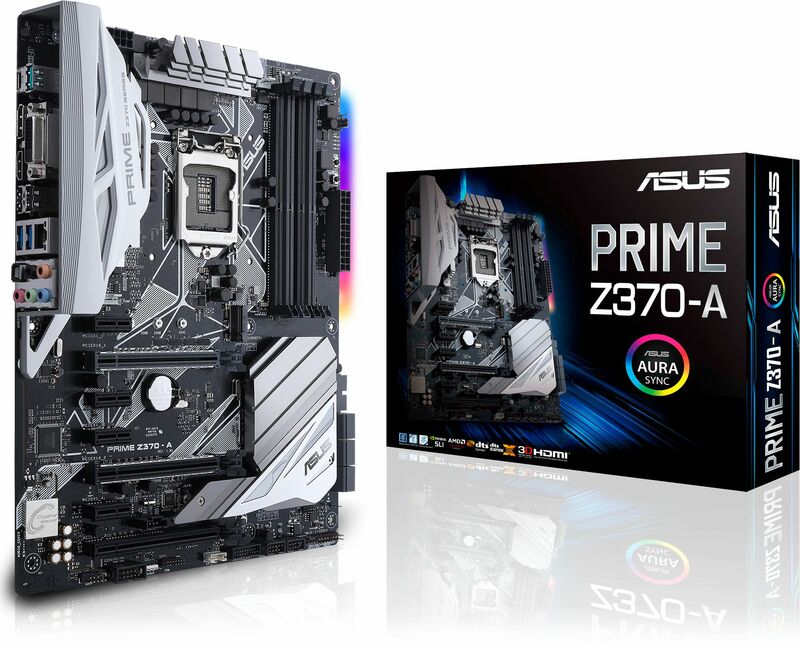 ASUS Prime Z370 Series motherboards provide the solid foundation needed for your first build, plus loads of scope to grow with your ambitions. ASUS have melded all the good stuff that's packed into the latest 8th Generation Intel Core processors with essential ASUS design and engineering, so you benefit from industry-leading technologies — including automated system tuning, comprehensive cooling controls, immersive onboard audio, and support for the ASUS Fan Extension Card. Build smart and easy with ASUS Prime Z370. The Intel Z370 is a single-chipset design that supports 8th Generation Intel Core LGA1151 processors. It provides improved performance by utilising serial point-to-point links, allowing increased bandwidth and stability. Additionally, the Z370 provides a maximum of 10 USB 3.1 Gen 1 ports, six SATA 6Gbps ports, and 32Gbps M.2 and PCIe 3.0 lane speed support, for faster data retrieval. Intel Z370 also supports integrated-graphics, so you'll enjoy the very latest in graphics performance. ASUS 5-Way Optimisation makes your PC smart. One click takes care of complex tuning, dynamically optimising essential aspects of the system to provide overclocking and cooling profiles that are tailored for your rig. With x4 PCI Express 3.0/2.0 bandwidth, M.2 supports up to 32Gbps data-transfer speeds. It's the perfect choice for an operating system or application drive, providing fast access to data. The Prime Z370-A also has an ultra-efficient heatsink to reduce M.2 SSD temperatures by up to 20°C and that means optimal storage performance and improved SSD longevity. Intel Optane is a revolutionary non-volatile memory technology supported by Prime Z370-A. Intel Optane memory modules accelerate attached storage to reduce boot and load times, so everything feels faster and more responsive. Prime Z370-A features the very latest Intel Ethernet. Intel's LAN has the advantage of reducing CPU overhead and offering exceptionally high TCP and UDP throughput for faster, smoother data transfer. Prime Z370-A utilises a unique audio codec designed in close collaboration with Realtek the Realtek S1220A. It also features an unprecedented 120dB signal-to-noise ratio for the stereo line-out and a 113dB SNR for the line-in, providing pristine audio quality. Additionally, a new impedance-sensing circuit automatically adjusts gain to ensure the optimal volume range for your headphones. A well-tuned enthusiast system deserves a matching aesthetic. ASUS Aura Sync offers full RGB control with a variety of functional presets for the built-in RGB LEDs as well as the LED strips connected to the onboard RGB headers. It can all be synced with an ever-growing portfolio of Aura-capable hardware. 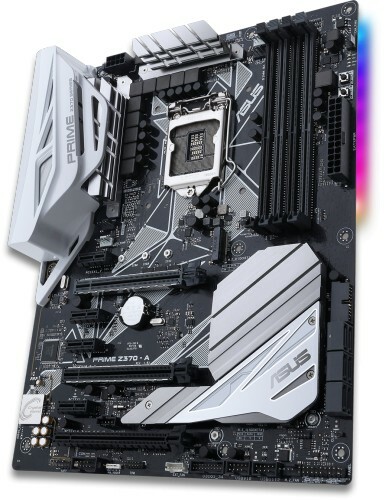 ASUS is the world's foremost motherboard manufacturer, renowned for their unique Design Thinking approach. ASUS' exhaustive testing exceeds industry standards, supported by high-quality components for exceptional real-world protection. Their motherboards are proven to be compatible with more than 1,000 components and devices, and each new model undergoes a minimum of 8,000 hours of strict validation. ASUS gives you the peace of mind of knowing that your motherboard is fit for all environments and applications. By choosing ASUS, you also gain the freedom to select outstanding component options, for trouble-free DIY experiences.